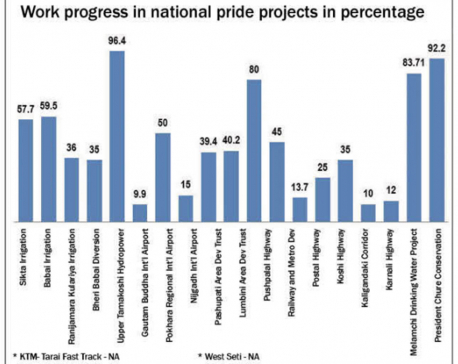 KATHMANDU, Sept 12: There has been significant progress in the national pride projects in the last fiscal year, according to a report tabled to the prime minister on Tuesday by National Planning Commission (NPC) at the 43rd meeting of National Action Development Committee. Sixteen out of 21 projects have seen work progress of over 80 percent in the Fiscal Year 2016/17, according to the report. Two projects saw progress in the range of 50 to 79 percent, while two other had progress of less than 50 percent. Less than a dozen projects had posted such impressive progress in the previous fiscal year. However, despite a little bit faster pace in the development works in the fiscal year ending mid-July after the new government took office in February, the results are not as impressive as they are tabled, said a former government secretary and also a former staffer at the NPC. The major change is in the Kathmandu-Tarai Expressway with 95 percent progress in physical and financial works, but the figure is misleading as the financial progress is measured on contract mobilization with 15 percent mobilization distribution, according to the official. It does not mean that the mobilized amount has been spent, the official added. The progress in this project was below five percent in the previous fiscal years. Gautam Buddha International Airport has also seen a good result, with 80 percent physical and 100 percent financial progress. The achievement was made after settling the disputes affecting the project. The physical progress in this project was only 58 percent while financial progress was 28 percent in the previous Fiscal Year 2016/17. Member of the NPC Min Bahadur Shahi stated that they have grouped the progress of projects into three categories for prioritizing and critically reviewing the projects that have been showing low progress. Though there is a policy of spending less in the final months, the concentration of spending in the last months has been higher than in the other months for most of the development projects. This indicates that the way of spending has not changed, according to Shanta Raj Subedi, former finance secretary. "Though the year-on-year progress in the projects is impressive, the overall progress has been bleak as the projects were started years ago and they still remain unfinished," Subedi said. He stressed on the need for enforcing the rule of freezing funds after mid-February for the projects that do not start work or achieve any significant change in the working style and spending mechanism. According to the experts, the factors that have affected the projects remain the same and the government with two-third majority has done nothing to effect any change in the project management. Neither has it ensured that construction materials are easily available and the project execution is closely observed, according to the experts.